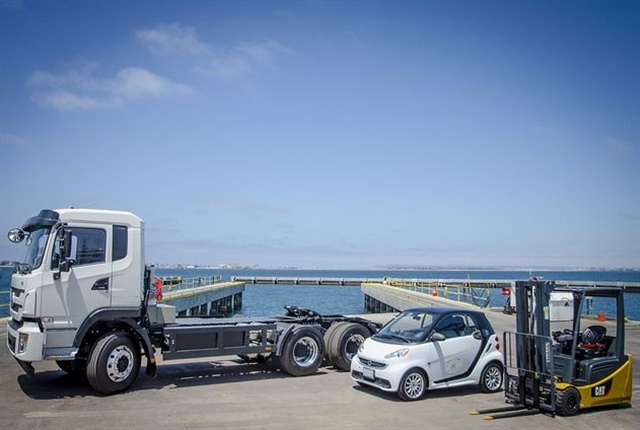 The San Diego Port Tenants Association (SDPTA) has received a $5.9 million grant from the California Energy Commission (CEC) for the development of all-electric medium- and heavy-duty vehicles for operation at the Port of San Diego. The grant award will be matched with $2.3 million in cash and contributions from partner tenants of the SDPTA. Together, the total project budget is $8.2 million, according to CEC. The SDPTA, its industrial tenant partners, and several subcontractors will develop and demonstrate 10 freight vehicles that are outfitted with zero-emission technologies. The grant funds demonstration projects for medium- and heavy-duty vehicle technologies, intelligent transportation systems and technologies, and deployment of natural gas vehicles. The project ties into the Port of San Diego’s 2013 Climate Action Plan. San Diego Gas & Electric (SDG&E), who supported the grant application, will study the charging patterns of the electric trucks to help maximize the use of renewable energy to power the vehicles. “Transportation electrification is crucial to reducing greenhouse gas emissions. There is a groundswell happening in San Diego for switching from gasoline as a fuel source to clean electricity – whether that means making the next car in your driveway an electric vehicle, or replacing heavy duty diesel at our local port with clean electric trucks, which is what this grant will do,” said Mike Schneider, SDG&E’s vice president of operations support and sustainability, and chief environmental officer.